The Day of Judgment is not the day which will determine the destinies of men; their destinies were fixed at the time they died (Heb 9:27; see here). We deny the doctrine of soul-sleep, the righteous pass from this life into the Intermediate State in bliss, while the wicked go into misery upon their deaths. But what is then the difference between what the wicked and righteous experience now in the Intermediate State and what they will experience after the Day of Judgment? Well for one, they were already judged at death and their judgment was private (Heb 9:27), but the Day of Judgment is public in which the secrets of men will be disclosed. Second, the joy and also the misery of men in the Intermediate State is bodiless. Their bodies lie rotting in the grave, while their souls are in places of peace or anguish. At the Day of Judgment, all the dead will be resurrected, their souls uniting with their bodies, and then come to appear before the throne of God. The difference then is that their everlasting punishment or their everlasting bliss is in body and soul, while in the Intermediate State it is in the soul alone. Moreover, the wicked will then be publicly condemned before the world, and the righteous publicly rewarded before the world, and all heaven will bless and praise God for His righteousness. There was a time when God let the nations go their way, but now that the Christ has come and suffered for all kinds of men, the people of God are no longer confined to a single nation (cf. Rev. 5:9). In accordance with the Savior's words, the Gospel is to be preached to all nations (Matt 28:18-19; Acts 1:8). Therefore, as the Gospel goes out to these nations, they are to respond to it positively, otherwise, they have no way of peace with God. God's command to everyone is “to repent”, i.e., turn back from sin and turn toward Him (see here). The motivation given for people to repent is because there is a Day of Judgment coming. This Day is “fixed” and the One who fixed it is God Himself who will expose the works of the wicked on the last day and give each man according to their works. Although God is said to be the judge, yet this judgment is by the “man whom he has appointed”, the Lord Jesus Christ. In John 5:22-23 we read, “The Father judges no one, but has given all judgment to the Son, 23 that all may honor the Son, just as they honor the Father. Whoever does not honor the Son does not honor the Father who sent him.” It is the Father's desire that everyone may honor the Son just as they honor Him. In other words, that all may honor the Son as divine. Therefore, being truly and everlastingly deity, He is the One appointed by the Father's authority to be the Judge of the World. On the Last Day, the Father will judge no one, but the Son, as divine and as the perfect image of the Father, will act on behalf of Him and judge every man according to their works. John 5:27 likewise says that the Father “has given him authority to execute judgment, because he is the Son of Man.” Acts 10:42 says that “he is the one appointed by God to be judge of the living and the dead.” 2 Timothy 4:2 says also the same. Paul says in Romans 2:16 that “God judges the secrets of men by Christ Jesus.” 2 Corinthians 5:10 says that “we must all appear before the judgment seat of Christ, so that each one may receive what is due for what he has done in the body, whether good or evil.” Matthew 25:31ff likewise records Christ as the One separating the sheep and the goats in the Final Judgment. When we read passages which speak about God being the Judge, that is absolutely true, because Christ is God and the Father wants all to honor the Son just like they honor the Father. Therefore, He has given the Son the authority to execute judgment. Returning to our passage in Acts 17:31, we see the subjects of this judgment being the world. Scripture teaches that both believer and unbeliever will appear before God in the Last Judgment. This is evident from Ecclesiastes 12:14; Matthew 7:21-23; 12:36-37; 25:31ff; Acts 17:30-31; Romans 2:6-16; 14:10-12; 2 Thessalonians 1:5-10; Revelation 11:18; 21:11-15. Sometimes Scripture is so explicit that it refers to believers having to stand before the judgment seat of God (Rom. 14:10-12; 1Cor. 4:5; 2Cor. 5:10; Ps. 50:4-6). Other times, the Scriptures warns of the judgment against the wicked (Matt. 10:15; 11:22, 24; 2Pet. 2:9; 3:7), but they both will stand before the throne of God on the last day, that is what Scripture teaches. Not only men, but angels also will come into the Judgment (Matt. 8:29; 1Cor. 6:3; 2Cor. 2:4; Jude 1:6). The Confession states that even the apostate angels will be judged. This is a Day of Judgment not only for men but also for angels. This is obviously based on Scripture. In Matthew 8:29, we read the demon speaking about a time in which he, along with his companions, will be tormented. In Jude 1:6, we read that “the angels who did not stay within their own position of authority”, God “has kept in eternal chains under gloomy darkness until the judgment of the great day”. In 2 Peter 2:4, says that “God did not spare angels when they sinned, but cast them into hell and committed them to chains of gloomy darkness to be kept until the judgment”. There is a time at which these angels will have to stand before the throne of Christ to be judged and condemned. Finally, 1 Corinthians 6:3 says, “Do you not know that we are to judge angels?” There are a lot of questions and speculations about this passage and the idea. Who are meant by the angels? Are good angels also included? Then this would probably be the only passage where good angels are subjects of judgment. Are they fallen angels? Then this will agree with other passages (2Pet. 2:4; Jude 1:6), therefore, it seems to me that the passage is speaking of fallen angels. But I cannot be dogmatic because generally the word "angel" is used positively. In other places where it means fallen angels, the context makes that clear (2Pet. 2:4 “angels when they sinned”; Jude 1:6 “angels who did not stay within their own position”). Therefore, I believe the NT is not clear whether good angels will be subjects for the judgment, although I doubt that they will be, but it is clear that fallen angels surely will. What is the nature of this judgment? There are a lot of questions about this, but there is also a lot of speculation as Scripture does not seem to say how exactly the saints will judge angels. Most seem to think that this judgment will consist in approving the judgments of God made against the fallen angels and the wicked. The Bible also teaches that the Last Judgment will take place at the coming of Christ, on the last day, that is the only time indication that the Bible gives (Matt. 24:36). 2 Thessalonians 1:5-10 tells that we will be granted relief when “when the Lord Jesus is revealed from heaven with his mighty angels” (v. 7), but He will not be granting relief to everyone. Rather, the Holy Spirit says that He will be revealed “in flaming fire, inflicting vengeance on those who do not know God and on those who do not obey the gospel of our Lord Jesus” (v. 8), through which they will suffer “eternal destruction” (v. 9), and that will happen “when he comes on that day to be glorified in his saints” (v. 10). Notice that on a singular day and with the same singular Parousia of Christ two opposite things happen: His coming brings joy and relief to His people, but it also brings eternal destruction and misery to those who do not know the Gospel of our God. This is the Final Judgment at the Second Coming of our Lord. 1 Corinthians 4:5 connects the time of judgment with the coming of Christ saying, “Therefore do not pronounce judgment before the time, before the Lord comes, who will bring to light the things now hidden in darkness and will disclose the purposes of the heart. Then each one will receive his commendation from God.” The time for judgment is after the Lord comes, and when the Lord comes He will bring to light the things now hidden. John 12:48 says that the judgment will take place “on the last day.” Matthew 25:31ff begins with the coming of the Lord in glory before going into the Final Judgment. The Day of the Lord is often connected with judgment, which is the day on which Christ will return. See here for more. There is a day and an hour fixed by God for the revelation of His perfect justice, which will certainly come and men should live with the knowledge of that. If they are outside of Christ, they have no hope, but if they are in Christ they will have confidence on that awesome day (1John 4:17). God will judge the world by His own standard. He is His own standard. 1 Samuel 2:3 says that “the LORD is a God of knowledge, and by him actions are weighed.” He is the standard which determines what is right and what is wrong. The Law which He has given us in the Ten Commandments—the moral law—is a reflection of His morally excellent character and the standard which we will be judged by. God is the Judge and He will do no one any wrong, for He is Just (Gen. 18:25). Repeatedly the Bible declares that God is just and He will judge the world by righteousness (e.g. Ps. 9:7-8; 96:10-13). He will not be bribed or be partial in His judgment (Rom. 2:9-11), but will give each man according to his works. No man outside of Christ can have any confidence of fulfilling God’s righteous standard or coming anywhere near that perfect standard. Therefore, there is no peace for those outside of Christ. On the other hand, believers have confidence (1John 4:17). The standard of judgment is the revealed will of God. There are several ways which we may know the revealed will of God. We have the will of God in 1) the law of nature, the moral law; 2) we have the revealed will of God in the Bible; and 3) we have the revealed will of God in the Gospel. Each will be judged according to the measure of knowledge they have of the will of God. This is evident from passages as Matthew 11:21-24; Luke 12:47-48; 20:47; 2 Corinthians 9:6. Luke 12:47 explicitly speaks about the Master's will. With the knowledge that we have of God's will, with that also we will be judged. This does not mean that people who have not heard the Gospel will not be judged, that would be contrary to the argument of Romans 1:18-32. But rather, the standard of judgment is the Law of God and the knowledge that we had of His will. This is why the Apostle Paul is harsher against Jews in Romans 2 than he was against the Gentiles in chapter 1. The reason is that the Jews have the oracles of God and they know with certainty what God approves and what He disapproves, because God has spoken in Holy Writ. On the other hand, the Gentiles do not have a special revelation of God, but they only have the general revelation of God in the created world. This does not excuse them, because the Apostle says very clearly that they knew God and that's why their without an excuse (Rom 1:20). Yet Scripture makes clear that their final condition will be a bit different than those who had a wider knowledge of God's will. This does not mean that they will not go to Hell, but rather, their torment will be "lighter" than those who receive a "severe beating" (Matt. 11:21-24). A person who has gone to Church for a long time, heard the faithful preaching of God's Word, heard the Gospel proclaimed and he denied it, will receive a severe beating, while a man living in the jungles of Africa will likewise be condemned, but his condition will be "lighter" in comparison to that rejector of the Gospel. This is no basis to ignore foreign missions or ignore sharing the Gospel with people who are un-churched or do not know much about God and the Bible. They will be judged and they will be in torment, it does not matter if their condition will be "lighter" in comparison to others. They still need saving. The most difficult aspect of the judgment is that fact that we are judged by our works. That this is the case is evident from several biblical passages in both testaments, such as: Job 34:11; Psalm 62:12; Ecclesiastes 12:14; Jeremiah 17:10; 32:19; Matthew 16:27; 25:34-46; John 5:28-29; Romans 2:6; 14:10-12; 1 Corinthians 3:8; 4:3-4; 2 Corinthians 5:10; Galatians 6:7-8; Ephesians 6:8; Colossians 3:25; 2 Timothy 4:14; 1 Peter 1:17; Revelation 2:23; 20:12; 22:12. Does this mean that we are justified by our works? Not at all. Scripture is clear that salvation and justification is by grace through faith (e.g. Eph. 2:8-9, see also here), not only that, but our works are explicitly excluded (Rom. 3:28; 4:6; Gal. 2:16). Therefore, how should we understand these two biblical truths? For those who believe in the inerrancy of Scripture the option cannot be that Paul or the other authors of Scripture are contradicting themselves, rather, it is what it is. The Bible teaches that we are justified by faith apart from our works, yet in the future, at the Last Judgment, we will be judged according to our works. Our works done in the body will determine either our eternal rewards or our eternal misery. The Lord Jesus teaches that we will give an account even for our words (Matt. 12:36-37). Thoughts are also not disconnected. All wickedness gets born in the heart and starts from there until it gives birth to the deeds. Lust, which is something mental (i.e., not an act as adultery is), is declared about our Lord as a violation of the Law (Matt. 5:27-29). By this, we learn that not only our works and words but also our thoughts will be liable to judgment. Oh sinner, flee to Christ! This servant owns, that the gifts he had were Christ's; he calls them, "thy pound"; and therefore did not glory in them as his own attainments, or, as if he had received them not; and ascribes the great increase, not to himself, but to the pound itself; to the gifts of Christ, as they were his, and as used by his grace and strength, and as blessed, and owned by him, to these purposes. The rewards which the Lord will render His people are gracious because even our best works are stained with sin and therefore do not merit any reward (Isa. 64:6). But because of His great love and grace, He will reward the works which He Himself, through His Spirit, worked in us, as though they were perfect because they’re washed with the blood of the Lamb. With the Last Judgment our eternal destiny is not at stake as we said at the beginning of the section. The Last Judgment is the public vindication of God’s justice. God will show that the people whom He has chosen and whom He has redeemed by the blood of the Lamb, have the works which demonstrate that they belong to Him, while on the other hand, the wicked with their wickedness demonstrate that they’re far away from God. In thinking about the Judgment, Christians should not doubt that they will be vindicated by God because they are believing on Christ. The basis of their salvation is in Christ alone, and even the rewards which they will receive at the Final Judgment are the rewards of works which His Spirit has worked in us (Phil. 2:11-12). But there must be a sense of awe and of solemnity when thinking about the Day of Judgment because we will have to give an account. We should want to be like Paul and together with him say, “we make it our aim to please him. For we must all appear before the judgment seat of Christ” (2Cor. 5:9-10). Thinking about the Day of Judgment makes us think about what is it we’re actually doing, it makes us evaluate our works. We do not want to displease God, but to please Him. Paul states that the purpose of us all appearing before Christ is “so that each one may receive what is due for what he has done in the body, whether good or evil” (2Cor. 5:10). The wicked will be paid back for their wickedness (Col. 3:25), and the righteous will be paid back for their righteousness (Eph. 6:8). 1John 4:16-18 So we have come to know and to believe the love that God has for us. God is love, and whoever abides in love abides in God, and God abides in him. 17 By this is love perfected with us, so that we may have confidence for the day of judgment, because as he is so also are we in this world. 18 There is no fear in love, but perfect love casts out fear. For fear has to do with punishment, and whoever fears has not been perfected in love. 1Cor. 4:5 Therefore do not pronounce judgment before the time, before the Lord comes, who will bring to light the things now hidden in darkness and will disclose the purposes of the heart. Then each one will receive his commendation from God. Although things hidden will come to light and the purposes of the heart will be disclosed, yet the fact remains that each Christian will “receive his commendation from God.” The KJV, HCSB, ISV say “praise.” The word is ἔπαινος (epainos, G1868) which basically means “approbation, commendation, praise” and is used in the NT 11 times (Rom. 2:29; 13:3; 1Cor. 4:5; 2Cor. 8:18; Eph. 1:6, 12, 14; Phil. 1:11; 4:8; 1Pet. 1:7; 2:14). It is never used in a negative way. It is used of the government praising or commending the good done (Rom. 13:3; 1Pet. 2:14); it is used of God (1Cor. 4:5); it is said to be the purpose to which we were predestined (Eph. 1:6, 12, 14), and finally our faith will “be found to result in praise and glory and honor at the revelation of Jesus Christ” (1Pet. 1:7). Here we have again confirmed what we learned from 1 John 4:17: believers have no need to dread the Day of Judgment. It is a day which will result in their praise, glory and honor. They will receive their commendation, praise and approbation from God, not condemnation. The point in looking to the uses of the word is to confirm that it is never used in relation to unbelievers, therefore, only believers will be commended. But if this is true then the way in which the judgment is described in 1 Corinthians 4:5 seems to imply that not all things revealed of believers were only good. I mean, the language of bringing things to light and disclosing the purposes of the heart implies that there are some bad works/sins to be revealed. Still, Paul does not say that believers will be condemned because of their bad works, but rather, “each one”, every believer, “will receive his commendation from God.” Our works will be tested by fire and some will be consumed, with no harm to our eternal salvation, and these works will be revealed as forgiven. This seems for me to be the solution to the question of the believers' work and the Day of Judgment still being a day of joy, commendation, and confidence to the believer. Rom. 2:6-11 He will render to each one according to his works: 7 to those who by patience in well-doing seek for glory and honor and immortality, he will give eternal life; 8 but for those who are self-seeking and do not obey the truth, but obey unrighteousness, there will be wrath and fury. 9 There will be tribulation and distress for every human being who does evil, the Jew first and also the Greek, 10 but glory and honor and peace for everyone who does good, the Jew first and also the Greek. 11 For God shows no partiality. It cannot be denied that what will follow in chapters 3-5 is the best discussion on justification by faith alone in the Bible, yet we clearly see the works principle here. We have already noted that there is no contradiction between these two doctrines. Indeed, if we see them as two separate doctrines and not one. Justification (salvation) is by faith alone which seals our fate for Heaven, but our rewards are according to our works. What Paul is teaching in Romans 2 is about the judgment of God who will give to each man what they deserve. One may question, “how do the redeemed deserve eternal life?” That is a good question. The redeemed deserve eternal life because of their Substitute Who fulfilled all conditions and kept the whole Law of God. In Him, they are perfectly righteous and therefore deserve every reward. Although they know that even their best works are stained with sin and deserve nothing but the wrath of God, yet this does not stop their belief that in Christ, they are righteous and therefore, the wrath of God is as far from them as the east is from the west. The believers are described as those who seek “for glory and honor and immortality” (v. 7). The believer seeks the things of God and wants to be where God is and they are ones who do well. They are ones who perform good works in the sight of God, and are able, by His Spirit, to do that which is pleasing in His sight by faith. On the other hand, the wicked are said to be not seeking for glory and honor and immortality, but rather, “self-seeking and do not obey the truth, but obey unrighteousness” and for them, there will be “wrath and fury” (v. 8). The wicked are described as those who are self-centered, seeking their pleasure alone and the things which are against God, Romans 1 speaks much to this effect. The description of the wicked is totally opposite to that of the righteous. While the righteous are described as those who are “well-doing”, it is said of the wicked that they “do not obey the truth”, but this is not all, they must obey something, therefore, they “obey unrighteousness”. Both groups demonstrate the condition of their hearts and of their relationship with God. The one who has been born of God, will seek the things of God, while the enemy of God, will remain an enemy unless changed by God into a friend. While the wicked will face “tribulation and distress” (v. 9), the righteous on the other hand will receive “glory and honor and peace” (v. 10). The wicked are described as those who do evil, while the righteous as those who do good and this is the basis for the statement that “God shows no partiality” (v. 11). This statement may function like a conclusion to vv. 6-10. Since God will judge everyone according to what they've done, rewarding the righteous and condemning the wicked, God thereby shows no favoritism toward Jew or Gentile (which is the reason that this passage was written). Since God judges both the Jew and the Gentile, including believers on the same basis, therefore, God shows no partiality. We must not separate the perfect righteousness of Christ from the evaluation of the believer's works by God. Without Christ, we are doomed. Since God has imputed Christ's righteousness, including His active obedience, to our account, therefore that perfect righteousness legally is ours and that is the only basis which we should have in thinking of the Day of Judgment with joy, confidence, and boldness. Then end, purpose and goal of God's appointing this day of judgment is for the manifestation of the glory of His mercy...and of His justice (Rom. 9:22-23). How is the glory of His mercy manifested? ...in the eternal salvation of the elect whom He has set free thanks to the perfect work of the Son on their behalf. The righteous shall go into everlasting life with the everlasting rewards which they shall receive and be in the presence of the Lord (Matt. 25:34, 46). Eternal bliss is the destiny of the righteous. But God will likewise manifest the glory of...His justice in the eternal damnation of the reprobate...who know not God, and obey not the Gospel of Jesus Christ (2Thess. 1:8-9), which is the only ground of right-standing with God. Since the only stand in their sinfulness with no covering from the Lord Jesus Christ, they stand naked for the unrestrained wrath of God. Therefore, they shall be cast aside into everlasting torments, and punished with everlasting destruction (e.g. 2Thess. 1:8-9; Matt. 25:41, 46). Their terrible and fearful lot is to be punished for all eternity. It is indeed a fearful thing to fall into the hands of the living God (Heb. 10:31). Although all of us deserve this punishment from God, yet no human mind can fathom the misery that is for the wicked and their lot. Many of us can sympathize with such a lot because we have not yet seen the fullness of God's righteousness and holiness as it is and compared sin with it. When we are in the presence of God, everlasting punishment will be the most reasonable thing to do with the wicked and we will praise God for it. On the Day of Judgment, God's decree of election and reprobation will fully come to pass and be manifested. God has ordained all things which come to pass, including the salvation and damnation of people, for the glory of His holy Name. He saves those who are not righteous and accepts them as righteous because of Jesus Christ to demonstrate His grace. At the same time, He leaves those who likewise are not righteous in their unrighteousness to demonstrate His justice and His wrath. The one group gets that which they do not deserve, the other gets that which they deserve. The center of the Day of Judgment is God, not man, as God will on that day vindicate His holiness and His justice. Jesus Christ will sit in judgment to vindicate the Name of the Triune God. The righteous, who are so because of imputed righteousness and not inherit righteousness, will be received into the New Heavens and New Earth, the home of righteousness and will be welcomed with the words: “Come, you who are blessed by my Father, inherit the kingdom prepared for you from the foundation of the world” (Matt. 25:34). Those are the ones of whom Christ said, “For I was hungry and you gave me food, I was thirsty and you gave me drink, I was a stranger and you welcomed me, I was naked and you clothed me, I was sick and you visited me, I was in prison and you came to me” (Matt. 25:35-36). The righteous are shown to be righteous by their deeds. Their deeds testify to their righteousness. On the other hand, to the wicked He says, “Depart from me, you cursed, into the eternal fire prepared for the devil and his angels” (Matt. 25:41). The wicked will share the same fate as the fallen angels in the eternal fire. The wicked are described as the opposite of the righteous: “For I was hungry and you gave me no food, I was thirsty and you gave me no drink, I was a stranger and you did not welcome me, naked and you did not clothe me, sick and in prison and you did not visit me” (Matt. 25:42-43). They will be condemned and sent to Hell because of their lack of good works, which testifies to the fact that they're not believers. There are only two destinations which the Bible knows of, either one goes into the presence of God, or out of the presence of God, and the conditions in these two places are antithetical. Now I want to focus more on Hell. It is the common confession of Christianity (whether Protestant, Roman Catholic, or Orthodox) that the wicked will be tormented without end in Hell. In recent times, the attack upon the doctrine of Hell has become more popular. The doctrine is very hard to swallow and it is a doctrine with which we are not happy. We may try to imagine the idea of what it means for a person to suffer unceasingly in Hell, but we simply cannot. The doctrine is very hard and terrifying, but the reason that it has received the prominence it has in all strands of Christianity throughout history is because it was a doctrine often taught by our Lord. It has been commonly observed that the Lord Jesus spoke more about Hell than about Heaven, and therefore, it is important to listen to His words. Indeed, no other person is capable of explaining Hell than the One who made it, and who really knows its nature. As we noted in chapter 31, the wicked at the present time go into Hades, which is Hell without the body, but after the Resurrection and the Judgment, the wicked will be sent to Hell in body and spirit. Therefore, technically speaking, Hell does not yet exist, but it will come after the Resurrection and Judgment (see Rev. 20:14). That being noted, we now move to consider what Scripture teaches us about Hell. Something that is directly connected with Hell is fire. Hell is described as a place in which fire burns the wicked (Matt. 5:22, 29-30; 18:9); a place in which the wicked are present both in body and soul (Matt. 10:28). In Mark 9:43, Hell is identified as “the unquenchable fire” (C.f. Luke 3:17; Matt. 3:12). In other places, Hell is described although the name is not mentioned. John the Baptist said that Christ will burn the chaff “with unquenchable fire” (Matt. 3:12). It is said to be “the eternal fire” (Matt. 18:8; 25:41). Matthew 13:40 says that the “the weeds are gathered and burned with fire, so will it be at the end of the age.” The judgment of the wicked in Hell will take place at the end of the age and it will be by fire. Hell is described as “the fiery furnace” (Matt. 13:42, 50). In Revelation 20:15, Hell is called “the lake of fire.” It is described as a place in which the worm does not die (Mark 9:48). It is called “the outer darkness” (Matt. 8:12; 22:13; 25:30) and “the gloom of utter darkness” (Jude 1:13). The wicked are said to be “tormented with fire and sulfur” (Rev. 14:10; 19:20); weeping and gnashing their teeth (Matt. 8:12; 13:42, 50; 22:13; 24:51; 25:30; Luke 13:28); and they “suffer the punishment of eternal destruction” (2Thess. 1:9). Basically, it is a place of torment where the wicked will be in (e.g. Rev. 21:8). Some think that the way in which Scripture speaks of Hell, as fire and outer darkness, is meant to be taken in a metaphorical way. I’m not sure, it may be so, but there are basically two groups who do this. One is the group which believes that saying that fire is metaphorical does not imply that Hell will be better than the traditional picture of Hell, rather, the reality is much stronger than the image. In other words, Hell is more terrible than you can imagine. Even if the worst thing that you can imagine is being tormented in fire forever, well, Hell is worse! The other camp tries to remove the idea of eternal suffering in body and soul. It may well be that the pictures of fire are meant to be taken in a metaphorical way, but this will not make Hell “less” endurable, but it will only make it more terrifying. Now the question before us is simply, “How long will the suffering in Hell go on?” Historic Christianity has answered that question with “forever” until recent times when attempts have been made to teach that the wicked will not suffer eternal torment, but will be annihilated. Basically, the wicked will not suffer conscious torment for all eternity as historic Christianity has taught, but they will cease to exist either after death or after the Final Judgment. Does Scripture support such an idea? Does Scripture teach that the suffering of the unrighteous will be momentary and not everlasting? We must look at passages which speak about the duration of the torments of Hell. The following is an attempt to show that the Bible teaches the unending punishment of the wicked. I do not intend it to be a refutation of Annihilationism, but more a positive case for the unending nature of hell-torments. The original word - αἰώνιον aionion - is employed in the New Testament 66 times. Of these, in 51 instances it is used of the happiness of the righteous; in two, of God’s existence; in six, of the church and the Messiah’s kingdom; and in the remaining seven, of the future punishment of the wicked. If in these seven instances we attach to the word the idea of limited duration, consistency requires that the same idea of limited duration should be given it in the 51 cases of its application to the future glory of the righteous, and the two instances of its application to God’s existence, and the six eases of its appropriation to the future reign of the Messiah and the glory and perpetuity of the church. But no one will presume to deny that in these instances it denotes unlimited duration, and therefore, in accordance with the sound laws of interpretation and of language itself, the same sense of unlimited duration must be given it when used of future punishment - Owen, in loc. We know that this has been the common and plain understanding of these words throughout the ages of the Church. If the condition of the righteous is one of unending life, the condition of the wicked should also be that of unending punishment. The strongest expression for our 'forever' is eis tous aionan ton aionon, 'for the eons of eons'; many aeons, each of vast duration, are multiplied by many more, which we imitate by 'forever and ever.' Human language is able to use only temporal terms to express what is altogether beyond time and timeless. The Greek takes its greatest term for time, the eon, pluralizes this, and then multiplies it by its own plural, even using articles which make these eons the definite ones. about the reign of the righteous on the New Earth (Rev 22:5). A similar expression (εἰς αἰῶνας αἰώνων, eis aionas aionon) is used concerning the torment of the wicked (Rev. 14:11). In none of these passages do we get any slight idea that this expression means anything less than endless things. Either the endless praise of God, or the endless glory which belongs to God, or the endless reign of the saints on the New Earth through all eternity. On what ground can we cast any doubts upon the torments of the ungodly, then? The torment of those in the lake of fire is said to be “day and night forever and ever”, this calls to mind Revelation 14:11 which contains “forever and ever” (the only difference is that the expression does not contain the definite articles) and “no rest day and night” concerning the condition of the Devil’s followers. Both the Devil and his followers will receive the same fate in the same place of torment. Satan is not the ruler of Hell, neither will the demons torment people as is commonly thought. But all who are in Hell will be tormented, both men and demons. In summary, we see in these passages (Rev. 14:9-11; 20:10 in connection with Matt. 25:41) the teaching of unceasing and unending punishment for all the wicked, men and angels. (2) is to be of the nature of punishment. The meaning then must be, that the soul is destroyed as to the great purposes of its being - its enjoyment, dignity, honor, holiness, happiness. It will not be annihilated, but will live and linger on in destruction. It seems difficult to conceive how anyone can profess to hold that this passage is a part of the Word of God, and yet deny the doctrine of future eternal punishment. It would not be possible to state that doctrine in clearer language than this. It is never is in clearer language in any creed or confession of faith, and if it is not true that the wicked will be punished forever, then it must be admitted that it would not have been possible to reveal the doctrine in human language! Who shall be punished with everlasting destruction,.... With destruction both of soul and body, though not with the annihilation of either; their gnawing worm of conscience will never die, and the fire of divine wrath will never be quenched; the smoke of their torment will ascend for ever. Sin being committed against an infinite and eternal Being, will be infinite in its duration; nor will it cease to be in the persons punished, who will not be in the least reformed or purged from sin by punishment; which will make the continuance of it just and necessary. Notice that the ungodly are said to suffer this everlasting destruction. Suffering and punishment presuppose consciousness, therefore their suffering this “eternal destruction” is a conscious suffering. A dead body is not punished nor can it suffer, the same goes for a rock, because these things lack consciousness. Neither could it be said that an annihilated body is suffering eternal destruction, for an annihilated body lacks consciousness. Yet the passage before us teaches the very fact that the wicked will experience and suffer this everlasting destruction. See also Robert A. Peterson's comments below on the destruction of the beast meaning his eternal torment (Rev. 17:8, 11 with Rev. 19:20; 20:10). A point which we discussed above and which I see as inconsistent with any idea of annihilation is the degrees of punishment in Hell. If the punishment of Hell is extinction and cessation of existence, then there is no “light beating” and “severe beating” (Luke 12:47-48), for all share in the same fate of annihilation. Therefore, the doctrine of degrees of punishment is annihilated by the teaching of annihilationism. It is no different for Chorazin or Bethsaida on the Day of Judgment than for Tyre and Sidon, for they will all meet the same fate, i.e., annihilation (Matt. 11:21-22). Why would the Day of Judgment be more “tolerable” for Sodom than Capernaum if they both share the same fate (Matt. 11:23-24)? What greater condemnation will the Pharisees receive if all men receive the same condemnation (Matt. 12:40; Luke 20:47)? Degrees of punishment does not make sense in Annihilationism. Couple to that the fact that some believe the doctrine of soul-sleep, this then means that the wicked never experience torment. Sinners are ‘cut off’ (Ps. 37:9, 22, 28, 34, 38), but so is the Messiah (Dan. 9:26); sinners are ‘destroyed’ (Ps. 143:12), but so was Israel (Hos. 13:9; cf. Isa. 9:14) and so were the sheep and coins that were then found (Luke 15:4, 8); unbelievers are said to ‘die,’ but then all of us have always been ‘dead’ (Rom. 6:13; 7:4; Eph. 2:1, 5; cf. Rom. 7:10, 13; 8:2, 6; I Tim. 5:6; Col. 2:13; Rev. 3:1), and that surely does not mean we have been without existence and consciousness. To destroy is to ruin. The nature of that ruin depends on the nature of the subject of which it is predicated. A thing is ruined when it is rendered unfit for use; when it is in such a state that it can no longer answer the end for which it was designed. A ship at sea, dismasted, rudderless, with its sides battered in, is ruined, but not annihilated. It is a ship still. A man destroys himself when he ruins his health, squanders his property, debases his character, and renders himself unfit to act his part in life. A soul is utterly and forever destroyed when it is reprobated, alienated from God, rendered a fit companion only for the devil and his angels. This is a destruction a thousandfold more fearful than annihilation. Another proof that destruction does not mean cessation of existence comes from Robert A. Peterson, who notes that ‘there is biblical evidence that the “destruction” of God’s enemies is their endless punishment. In Revelation 17:8, 11 “destruction” (apoleia) is prophesied for “the beast.” Two chapters later the beast and false prophet are “thrown alive into the fiery lake of burning sulfur” (Rev. 19:20). John teaches that after Satan is cast into this lake, he, the beast, and the false prophet, “will be tormented day and night for ever and ever” (Rev. 20:10). The beast’s “destruction,” therefore, is not annihilation, but eternal punishment.’ Therefore, the idea of destruction, biblically, does not mean non-existence. Finally, an argument for endless punishment comes from the fact that the only Person who satisfied the wrath of God was the Lord Jesus Christ. He is the only propitiation spoken of in the Bible. He is the only Sacrifice which satisfies the wrath of God and turns His anger from us. Nowhere in the Bible do we get the idea that man can atone for his own sins without the Savior, nor is second-chance salvation taught in Scripture. My point here is that the biblical teaching is that Christ alone has satisfied the wrath of God for the elect. Therefore, the reprobate will have to answer for their sins, unshielded from the wrath of God through which they will suffer everlasting destruction. Since man cannot atone for his owns sins, therefore his punishment is never-ending. Couple to that the nature of his sins against an infinitely holy God. Our modern culture has no sense about the depths or seriousness of sin or of the standard of righteousness. If sins against earthly authorities are sometimes punished severely, how much more sins against an infinitely holy God? We must understand that each and every sin is first of all a sin against God (Ps. 51:4; Luke 15:21) and every sin is a transgression of His holy standard (1John 3:4) and a point for which we must give an account. But since the sinner has not received Christ, he stands unprotected from the wrath of God before the Throne of Judgment. Since the sinner cannot atone for himself through his death or suffering, therefore he will suffer forever, without ever atoning for his sins, as just punishment from God, against Whom he has sinned and rebelled. We do not go by our measurements of justice or our feelings, we must go by the infallible Word of God. Therefore, there is no need to repeat the most basic objection against Hell, in that it is inconsistent with God's love. These things convince me of the endless punishment of the reporbate. Just as God was described as Just, so likewise His judgments reflect His character. Heaven has no problem in praising God for His judgments against the great whore of Babylon, the wicked world system, which is tormented (Rev. 18:10, 15). Heaven is happy and is occupied with joy and praise of God, because God is just and He has demonstrated that through His judgment of the great prostitute. Furthermore, God is praised for answering the prayers of the martyred saints in Revelation 6:11. They even praise God for the smoke which goes up from her forever and ever. This expression is used in Revelation 14:11 to speak of the unceasing torment of the reprobate, and therefore it is very interesting that this is a point for which God is praised. Now having mentioned Revelation 14, we see there that the torment of the wicked takes place “in the presence of the holy angels and in the presence of the Lamb” (Rev. 14:10). We have reason to believe that if the angels can see it, redeemed men can see it too. For one, the Hell before the Final Judgment, Hades, was visible for Abraham and Lazarus in Heaven. Second, Isaiah 66:24, whose description the Lord Jesus applies to Hell in Mark 9:48, says that the worshipers of God will “go out and look on the dead bodies of the men who have rebelled against me.” Hell will serve as a contrast between the great justice and wrath of God, and the great grace and love of God. The Bible teaches that both men (Matt. 25:46; Rev. 14:9-11; 20:15; 21:8), as well as fallen angels/demons (Rev. 20:10; 2Pet. 2:4; Jude 1:6), will be inhabitants of Hell. They are in Hell, not because of correction, but because of a punitive punishment for their sins. The question which we must ask is: Who is the one who will punish them? The popular idea is that Satan and his demons torment the sinners in Hell. Strangely, I still haven’t encountered that idea in the Bible. What I believe the Bible teaches is that God is the One who inflicts the punishment upon the wicked in Hell. Although this seems emotionally difficult, but what else can we say? God is the offended party and He will inflict the punishment. Several times when the Lord Jesus encountered demons they told Him not to “torment” them (Mark 5:7; Matt 8:29; Luke 8:28). This is very strange and it is evidence that the usual idea of “demons torturing people in Hell” is incorrect and with no biblical support. The demons shudder from the Lord Jesus, their Judge and Tormentor. The demons beg Him saying, “I adjure you by God, do not torment me” (Mark 5:7). A group of demons is terrified at the presence of Christ and inquires, “Have you come here to torment us before the time?” (Matt. 8:29). The demons acknowledge that it is Christ with Whom they have to deal and it is Christ who will inflict punishment upon them. The same word is used with reference to the worshipers of the beast (Rev. 14:10), i.e., the reprobate, and also the Devil, beast and false prophet (Rev. 20:10). Their Judge and Tormentor is the Lord Jesus Christ. Ἀπὸ, from) It is a judicial procedure from the Divine presence itself, that will inflict punishment upon them. מפני, from the face. Devils will not be the tormentors; for even in this life bad men are not punished by devils, but rather by good angels: and in Psa 78:49, the phrase, angels of (bringing) evil, may even denote good angels. Exo 12:23; 2Sa 24:16.—ΠΡΟΣΏΠΟΥ, the face) This face will be intolerable to them; they shall not see it, but they shall be made to feel it. Face and glory are generally parallel.—ἰσχύος, of His might) Lay aside your fierceness (haughty confidence of ‘might’) ye wicked men! The phrase ἀπὸ προσώπου τοῦ κυρίου (apo prosopou tou kyriou, from the face of the Lord) is also used in Acts 3:20 is which “the presence of the Lord” is a cause of the “times of refreshing” which would come and signifies God’s gracious face. The wicked in Revelation 6:16 want to hide from the “from the face [ἀπὸ προσώπου, apo prosopou] of him who is seated on the throne, and from the wrath of the Lamb”. In this passage, the face or presence of God is connected with the wrath of the Lamb. To be in the presence or before the face of God in the context of Revelation 6:16 is not good! Even Heinrich Meyer, who disagrees with us, says that “there is an essential inconvenience to this second mode of interpretation [which sees apo as causative], inasmuch as by its assumption without the introduction of a new idea there is only a repetition in other words of what has already been said in 2Th 1:7-8 from ἐν τῇ ἀποκαλύψει [in the revelation] to διδόντος ἐκδίκησιν [suffer justice]; the whole of the 9th verse would only contain αἰώνιον [eternal] as a new point.” Basically, our idea that the wicked receive their punishment stands on the ground of v. 8, even if v. 9 is to be understood merely of separation and not also cause, for we do not separate both, when the “presence” is properly defined. The Lord Jesus, being God and Man, representative of the Father, Second Person of the Blessed Trinity, is the offended party which will inflict punishment both upon reprobate angels and men. There is strict justice which demands the punishment of sin and there is non-justice. Non-justice includes injustice and grace. Injustice is clearly wrong and God is not unjust, and therefore, He is not glorified by being unjust. But He is glorified and praised for being just (see above The Praises Of Heaven), and likewise merciful (e.g. Ps. 28:6; 116:1-2). His glory in non-justice is not by injustice, but by mercy and grace. 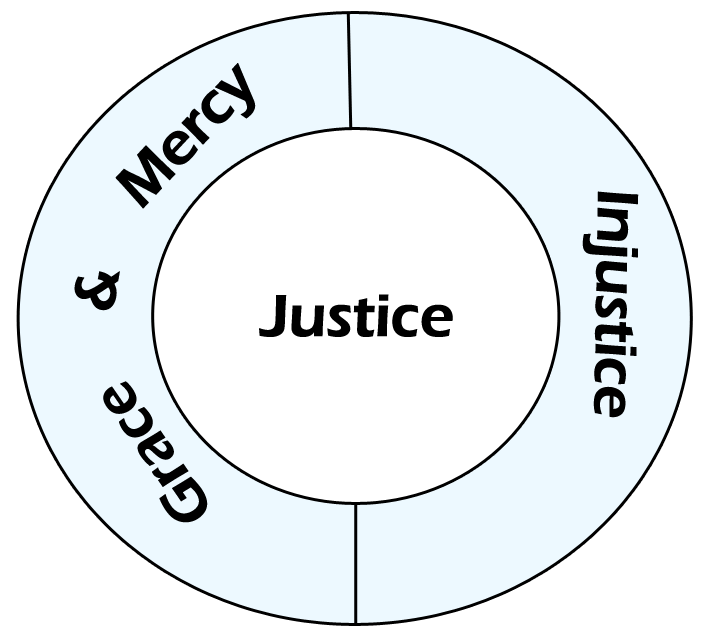 Mercy and grace is a category outside of strict justice, but it is not injustice. We receive mercy and grace and are justified because of a Substitute who received strict justice on behalf of the elect. In this God is glorified both in His justice and in His grace. For He is shown to be severe against those who dishonor Him, giving His enemies what they deserve; and on the other hand showing amazing grace and condescending to redeem, and thereby glorifying His mercy and grace (Rom. 11:22). God has desired to show all the range of His attributes, from His justice and wrath to His grace, mercy and love, all of which are holy, holy, holy. As Christ would have us to be certainly persuaded that there shall be a day of judgment, both to deter all men from sin, 1 and for the greater consolation of the godly in their adversity, 2 so will he have the day unknown to men, that they may shake off all carnal security, and be always watchful, because they know not at what hour the Lord will come, 3 and may ever be prepared to say, Come Lord Jesus; come quickly. 4 Amen. The thought of a day of judgment should deter all men from sin (2 Cor. 5:10-11) as there will come the time when they will have to give an account for each and every sinful action and thought (e.g. Matt. 12:36). Therefore, it is proper to fear and keep the day of judgment in mind. Although Christians should not fear the day of judgment (1John 4:17). But is also a source of great consolation for the godly in their adversity (2 Thess. 1:5-7) as we know that we will be vindicated and our enemies punished for what they have done to us. It is with this thought in mind that we accept suffering at the hands of the wicked and do not resist evil with evil, but with good. It has pleased the Lord, to shake off all carnal security and to cause us to be always watchful (Mark 13:35-37) to make the day unknown to men (Matt. 24:36). He has not revealed it to us so that the wicked would not be prepared and the righteous may always be watchful for the Lord's coming and ever be prepared to say, Come Lord Jesus; come quickly. Amen (Rev. 22:20). Christ, the God-Man, spoke more about Hell than Heaven, because He knew it is terrible and he forewarns us about where our choices will bring us. Therefore, it is a mercy from God that He has given us special revelation about this terrible place called Hell in which the ungodly will suffer without end, so that we would be saved from it through the Savior. Paul, after speaking about the judgment seat of Christ, says, “Therefore, knowing the fear of the Lord, we persuade others” (2Cor. 5:11). He knows how terrible it is to be a subject to God’s condemnation and of His punishment. Paul knows what he was saved from, he was saved from God and from His holy wrath. Hebrews 10:31 gives a sobering warning: “It is a fearful thing to fall into the hands of the living God.” He is our Judge and He will inflict the punishment and it is a terrible thing to fall into the hands of God, but this God is described as the true and living God. According to the Bible and to Jonathan Edwards, this God is an Angry God against sinners, therefore, Sinners [are] in the Hands of an Angry God outside of Christ. There is no protection from the wrath of God outside of Christ who bore His wrath in our place. Therefore, knowing the fear of the Lord and knowing what the Bible says about the afterlife for the ungodly, we should be more earnest in our evangelism and in persuading people to reconcile with God. On the Day of Judgment, the Lord’s people will be in joy, in peace and have confidence as we saw in paragraph 1, as they will be vindicated and rewarded for their works done in faith through the Spirit. Therefore, the thought of the Day of Judgment brings encouragement to the believer in that their works are not in vain and that God works everything according to His will and will reward them on the last day. Moreover, the Day of Judgment gives the believers encouragement in enduring trials in this life, knowing that they will be vindicated and their foes will be judged on the last day. They will see the downfall of their enemies and their enemies will see the glory and praise of the children of God. We are the children of the King, and therefore anyone who “messes” with us, “messes” with the King. Until He comes, we are to engage in the business of our Master, doing His work and expecting His return, although we know not at what hour He will come. The Lord was explicit that no man will know the day or hour of His Second Coming (e.g. Matt. 24:36). Therefore, we should always be awake (Mark 13:35-37), and busy with the Master’s work, so that when He returns, He will see us doing His work. We don’t want the Master to come back and see us sleeping and neglecting His work. Therefore, we should always be watchful and in the expectation that He would come, crying from the bottom of our hearts and longingly saying, "Come, Lord Jesus!" (Rev. 22:20). a, b, c Albert Barnes' Notes on the Bible. Taken from the TheWord Bible Software. In loc. ^ Alan W. Gomes. Evangelicals and the Annihilation of Hell Part One. Bible Research. a, b Jonathan Edwards. The Eternity of Hell’s Torments. ^ The Pulpit Commentary. Taken from the TheWord Bible Software. In loc. a, b Robert A. Peterson. The Dark Side of Eternity: Hell as Eternal Conscious Punishment. Christian Research Institute. ^ G. K. Beale, David H. Campbell. Revelation: A Shorter Commentary. (Grand Rapids, Michigan: Wm. B. Eerdmans Publishing. 2015). p. 305. ^ As quoted in Alan W. Gomes. Evangelicals and the Annihilation of Hell Part One. ^ Robert L. Dabney. Systematic Theology. (Edinburgh: Banner of Truth Trust, 1985). p. 854. ^ As quoted in Stephen E. Alexander, Flaws in the Arguments for Annihilationism. a, b Alan W. Gomes. Evangelicals and the Annihilation of Hell Part Two. Bible Research. ^ Charles Hodge. Future Punishment. ^ Thayer's Greek Lexicon in Bible Hub, 575. apo. ^ Johann Albrecht Bengel. Gnomon of the NT. Taken from the TheWord Bible Software. In loc. ^ Heinrich Meyer. Critical and Exegetical NT. Taken from the TheWord Bible Software. In loc. Words within square brackets supplied.